Each year, tens of millions of consumers rely upon paid tax preparers to help them file accurate and compliant tax returns, yet the majority of these preparers are not subject to any minimum standards. 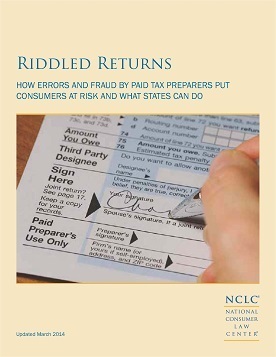 This National Consumer Law Center report documents how a lack of regulation has allowed incompetence and fraud by tax preparers to flourish and urges states to require paid preparers to demonstrate basic competency and skills as well as to provide upfront fee disclosures. Updated: March 2014, ©National Consumer Law Center, Inc. This report builds on NCLC’s advocacy and public policy work on consumer protections related to tax-time financial products to promote family financial well-being. Learn more about NCLC’s work in this area. Tens of millions of United States residents, including over 60% of lower-income Earned Income Tax Credit (EITC) recipients, use paid tax preparers. Yet 46 states have more regulatory requirements for hairdressers than tax preparers. Indeed, certified public accountants, enrolled agents credentialed by the IRS, and unpaid volunteers at the Volunteer Income Assistance sites are the only tax preparers subject to testing and regulatory oversight. The Internal Revenue Service attempted to develop a system to regulate tax preparers to ensure basic competence levels. A 2013 court decision ruled that the regulations exceeded the agency’s authority. Therefore, states must take the lead to prevent incompetence and fraud by paid tax preparers. Incompetence and fraud by paid tax preparers point to a widespread and endemic problem across the industry. Mystery shopper testing done by the government agencies, consumer groups, and advocacy organizations over the last several years have found that a significant percentage of paid tax preparers’ tested resulted in errors, fraud, and other abuses. Lack of transparency in fees is highly problematic. High and inflated tax preparation fees of up to $500 for simple returns were documented by mystery shoppers. Tax preparation is one of the few consumer services for which consumers cannot comparison shop because they can’t obtain a price prior to services being delivered. Obtain a registration unless they fit into one of exceptions for the limited number of tax preparers already regulated, such as certified public accountants, enrolled agents, and lawyers. Pass a basic competency exam. Have 60 hours of initial education and 15 hours per year of continuing education. Provide a standardized disclosure of their fees. To assist states in developing a system to regulate tax preparers, NCLC has developed the Model Individual Tax Preparer Regulation Act, based on the laws of three states that do regulate tax preparers (Maryland, Oregon and California), as well as the IRS regulations.